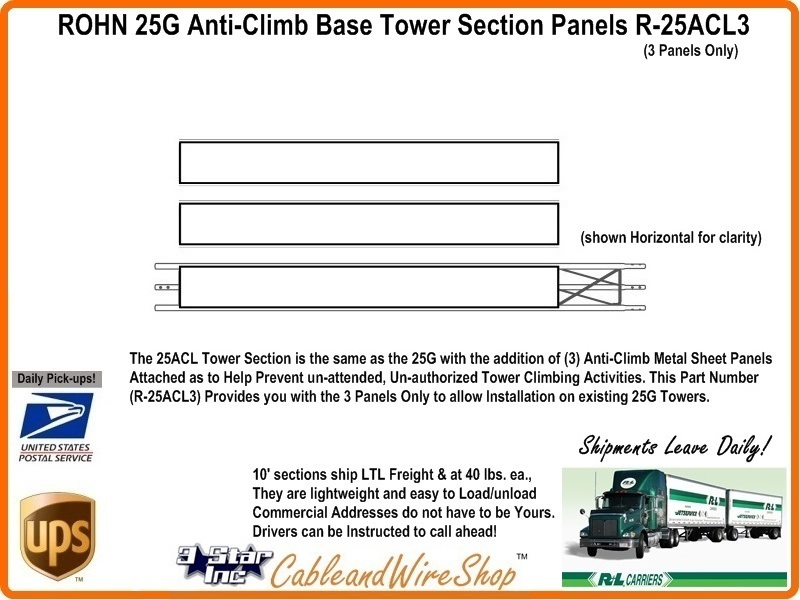 The 25ACL3 is (3) Panels and Installation Hardware only. Available for Installation on the Standard 10 foot 25G Tower Section length for an Existing Tower Installation Site. The 25ACL Tower Section is the same as the 25G with the addition of these (3) Anti-Climb Metal Sheet Panels Attached as to Help Prevent un-attended, Un-authorized Tower Climbing Activities. Note: We recommend that Tower owners that would have any question of Liability for Un-Authorized Access and Climbing of their Towers when Un-attended should contact their attorney and take whatever steps are necessary to Protect themselves from others that lack self control. It seems that just like the cases involving Un-attended Pools, Security directly attributable to Prevention that is in direct Proximity to and on the Potential Hazard in questiongoes a long way in Defense against others who don't have the Common Sense God gave an Animal Cracker on Sunday, and want to be Rewarded for Same! Make Sure that all Warning labels Supplied with ALL ROHN Products are Installed with the Tower according to the Manufacturer's Recommendations. Always install ROHN Towers and Parts with Professional Guidance and Assistance, following the Specification sheets supplied by the Original Manufacturer without Alteration.